On this last day of April, I'm listing this jacket in the "Finished in 2017" column. Yay! 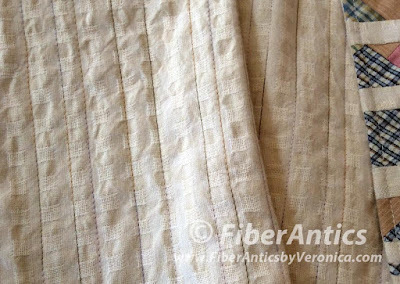 Here is Part 2 of the process for making this vintage and yarn-dyed fabric jacket. 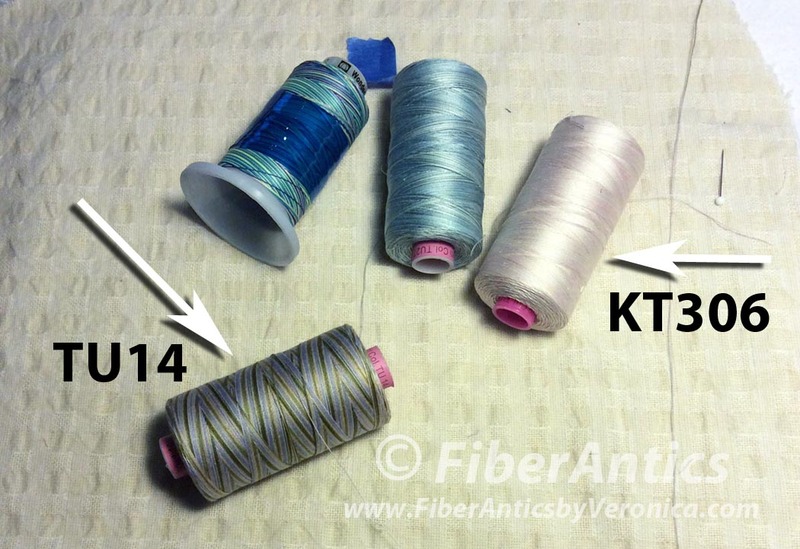 Read about the inspiration and fabric prep in Part 1. As a quilter, I often incorporate quilting in my garments. Jackets especially lend themselves to this process. I learned this "quilted garment" concept from a fabulous folk artist, instructor and friend, Rachel Clark. Check out Rachel's work and patterns on her website, "Clothing for the Body and Soul," and social media sites for inspiration. She makes amazing pieces! This jacket is "quilted." It has three layers with stitching to keep the layers together. It has (1) a pieced front, (2) a piece of flannel in the middle, and (3) a silk lining fabric—all sandwiched together. It is machine quilted with straight lines using a walking foot. Stitch length = 2.8mm - 3mm. For the style of this jacket, I thought a cotton thread with a matte finish was appropriate. I wanted a little color and contrast to the creamy yarn-dyed woven [PRF-715 from the Primitive collection by Diamond Textiles] and a color palette that would complement the colors in the patchwork. I chose a WonderFil 50 wt. variegated cotton (Tutti #TU14) with a soft color palette of grey, lavender, yellow and moss green. (This is one of my all-time favorite variegated thread color combos and one of the things that drew me to the WonderFil line of threads.) The bobbin was also a 50wt. cotton (WonderFil Konfetti #KT306) in a soft blush color that blended nicely with the color of the jacket's silk lining. 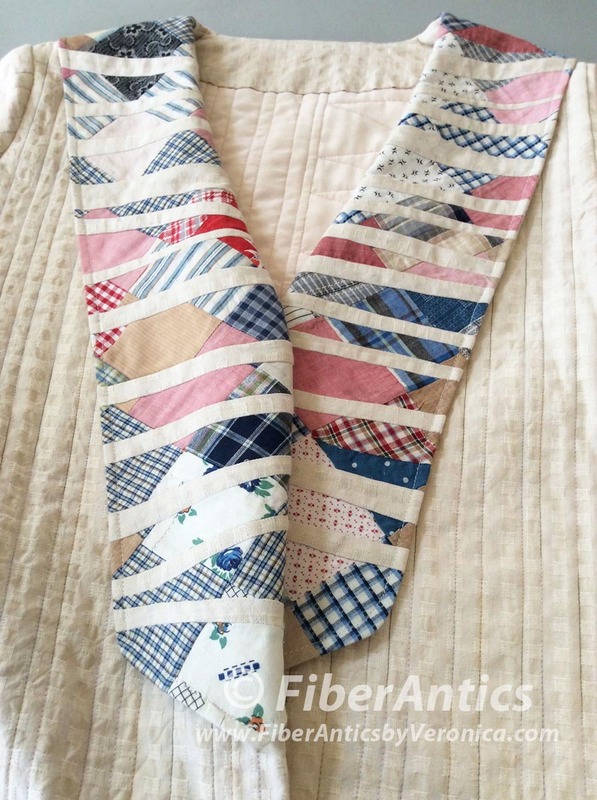 Because of the woven windowpane pattern in the fabric, it was easy to keep the quilting lines straight and parallel (no marking!). I've been told that the fabric looks like a pinstripe from a distance. Straight line quilting with the walking foot. The jacket pieces—left and right fronts, back, sleeves—were quilted before jacket assembly. When I brought this piece to a recent quilt guild meeting, one of my guild friends asked if I cut out the pattern pieces larger to accommodate the shrinkage from quilting. This is a good idea! When I plan to quilt a garment, cutting the pieces slightly oversize, quilting them, and then trimming the quilted pieces to the pattern piece is my process. This project started off with another direction in mind, so were not cut oversize. 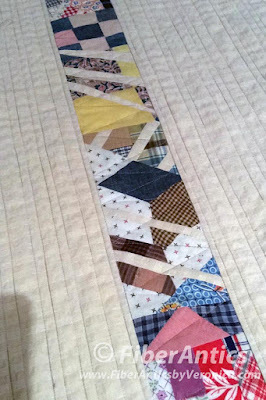 However, the parallel lines of quilting did not cause the pieces to shrink excessively, so it was fine. The flannel (middle layer) and the silk lining (back layer) were cut larger than the front pieces. The larger layers can be seen in the photo below. Here is the jacket back with straight line quilting. The parallel lines were randomly spaced (again, no marking!). 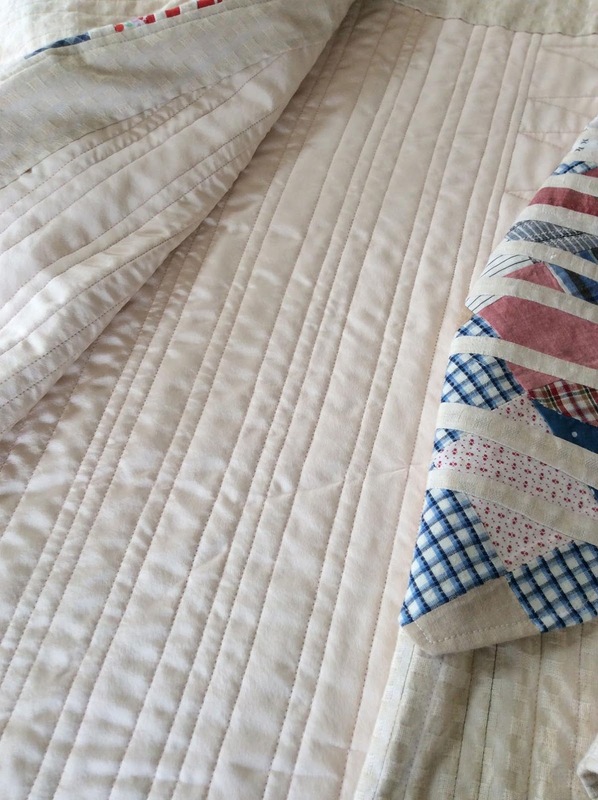 A large zigzag design was quilted on the patchwork insert. Quilted jacket back with patchwork insert. 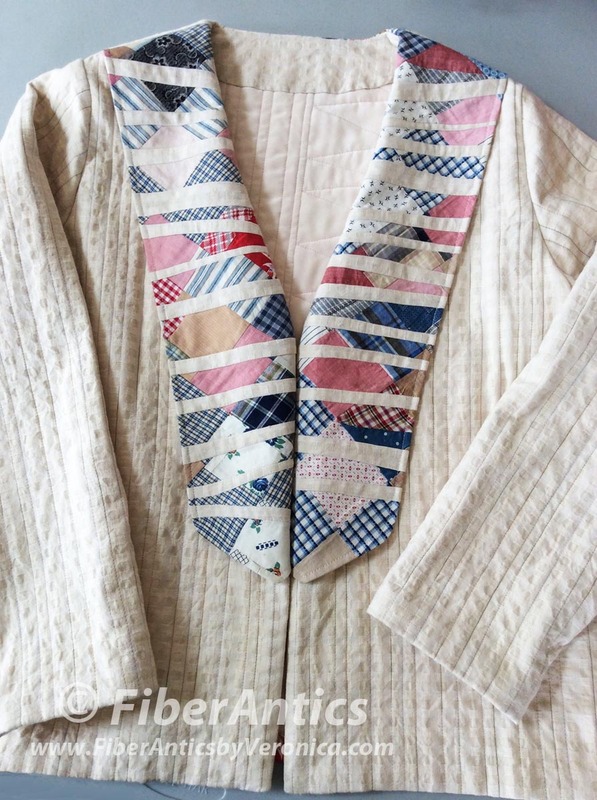 The collar was interfaced, faced and turned, but not quilted. The outside edges were top stitched. Patchwork collar with vintage fabrics. 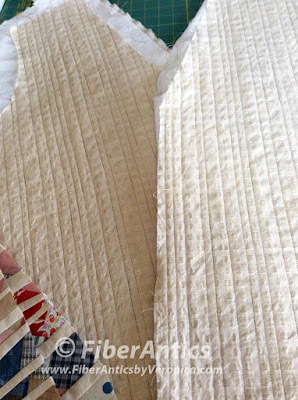 Here is a view of the quilting from the jacket's inside. The silk lining fabric makes is easy to slip the jacket on and off. Neck and front facings were cut from the yarn-dyed woven. They were tacked down by hand to the lining. 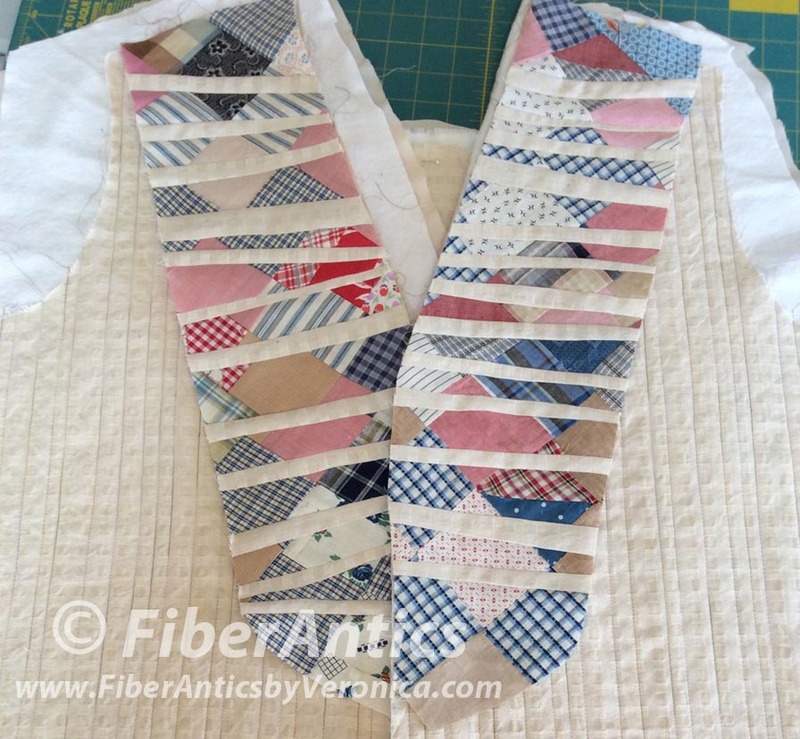 Improv patchwork collar with vintage and modern fabrics. This jacket is going to Spring Quilt Market with me this year. I'll be meeting with the President of Diamond Textiles and hope to find Mary Kerr on the show floor to show them both how I was inspired by them, their product and techniques. A 2017 finish! Hope you enjoyed reading about the process. Your jacket is gorgeous! Maybe we can say hi at the Spring Quilt Market--will be at the Colonial Needle booth most of the time. Doing a Schoolhouse for StudioE and a Take & Teach for Colonial. Thank you, Pepper! It would be lovely to touch base with you at Market. I'll look you up at the Colonial booth. Annual Easter egg dying—what's your favorite?